Looking for a healthy vegan breakfast that tastes fantastic? The banana smoothie is your answer. There is no better way that you can start off your day than with fruit. It's not really an exaggeration to call the banana smoothie the ultimate vegan breakfast. Oatmeal, toast, and cereal, not to mention the jam and sugar you might sprinkle on them, are less than ideal. Bananas work better. Here's why. Studies have shown that that when you've eaten breakfast, you perform better at school and at work. (1,2) It's an important way to start your day. On the other hand, we have the ancient Chinese Proverb: "Full stomach, empty head." Chinese students often eat lightly or not at all before a test. Can they both be right? In a way, yes. Your body and mind need calories, specifically from sugar and carbohydrates, to function properly. On the other hand, digestion takes up a huge amount of your body's energy. Have you ever stuffed yourself at Thanksgiving and the then promptly fallen asleep on the couch? To a lesser degree, this is the same thing that happens every time you eat a meal. At least some of your energy is diverted away from the mind and other day to day functions and sent to the gut to digest your meal. You're not going to be at your mental or physical peak when your body is busy trying to break down the processed junk in your stomach. A banana will likely be completely digested and out of your stomach within 30 minutes to an hour. A bowl of oatmeal or a waffle with syrup can can sit in your stomach for hours, drawing away your precious energy. All fruit is fantastic, whether you eat it whole or in smoothie form, and there can be little doubt that they tower over more common vegan breakfast foods in every way. 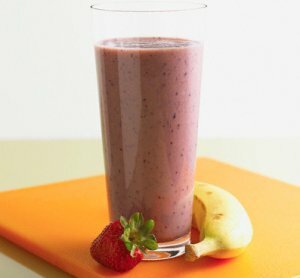 Bananas, however, are quite special unto themselves, and worth eating on a regular basis in your smoothies. According to Dr. Doug Graham, besides the large amounts of enzymes and vitamins present in bananas, "Whether a quick release of energy or a long-lasting supply of energy is needed, bananas supply the right fuel for the occasion. They contain two types of sugars, glucose and fructose. Bananas work great if you're looking for mental or physical energy, or if you're trying to lose weight. A medium-sized banana has around 80-100 calories. They digest well,and they keep you feeling contented long after they've left your stomach. They also contain nothing toxic, like salt, which forces your body to hold onto water and your weight to increase. The banana smoothie, which I hold to be the ultimate vegan breakfast, is also really easy to make. Simply throw however many bananas you'd like into a blender, add enough water to match the consistency you enjoy, perhaps add an ice cube or two if you like it cool, and hit the switch. Your smoothie is ready in a couple of minutes, and you have a great vegan breakfast that will start your day off right. 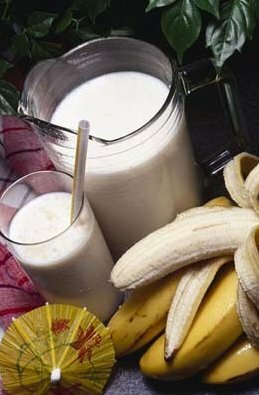 The thickness can vary from a a thick shake to a more watery "banana milk". Want variety? Experiment with throwing berries in with the bananas. I'm especially partial to blueberry and blackberry, but raspberry, strawberry, and numerous other types make delicious drinks as well. So wake up tomorrow to a banana smoothie. You won't regret it. Want to start eating smoothies but you're blenderless or your blender's a clunker? People ask me for suggestions all the time and I always tell them to go with a fantastic Vita Mix. Looking for more information about a healthy raw food diet that will set you on a path or energy, strength, and joy? Read about how this vegan breakfast fits into a healthy raw food diet. And how you can better yourself by Changing your lifestyle. (1)Murphy JM, Wehler CA, Pagano ME, Little M, Kleinman RE, Jellinek MS. "Relationship Between Hunger and Psychosocial Functioning in Low-Income American Children." Journal of the American Academy of Child and Adolescent Psychiatry, February, 1998. (2)Warren JM, Henry CJ, Simonite V. "Low Glycemic Index Breakfasts and Reduced Food Intake in Preadolescent Children." Pediatrics, November 2003. (4) Dr. Douglas Graham, "On Nutrition and Athletic Performance" pg. 41. (5) Dr. Douglas Graham, "On Nutrition and Athletic Performance" pg 63.